La Cava del Tequila has become a favorite for Epcot’s guests since it first opened in 2009. The reasons we love this little nook inside the Mexico Pavilion are pretty limitless. Guests of all ages find themselves at home here. For those of you who have never stopped in but were maybe looking for some reasons to – we managed to narrow it down to the top 5 things to love about this magical place. 5. Love it for the Food! The folks at La Cava know that tequila is best enjoyed with something scrumptious to eat. You won’t find large entrees here, but what you will find, are dishes served “tapas style.” These small plates have been carefully chosen to precisely harmonize with the skillfully crafted beverages you will enjoy at La Cava. A crowd favorite is the Trio Combo, which consists of tortilla chips, salsa, queso, and guacamole. It is no accident that the colors of these foods represent those of the Mexican flag. If you are looking for something more adventurous, try the Acapulco-style shrimp cocktail, which is served with spicy marinated tomato sauce and fried corn tortillas. Mmmmm…. 4. Love it for the Flight! You will find the 200 varieties of tequila at La Cava to be separated in categories. Tequila Blanco will have a pure flavor. Tequila Reposado has a taste that balances wood, fruity notes, vanilla and spices. Finally, Tequila Añejo is a delicate blend of aged tequilas that are smooth, distinctive and they get their flavors from several aromas such as chocolate, almonds, and wood. Each category is loved for different reasons – so why choose just one? Go with the Tequila Flight that they offer at La Cava. It is the perfect choice every time because you will get a taste from each category. There is also a Supreme Flight that offers even more. 3. Love it for the Specialty Cocktails! No worries at all if straight tequila is not your thing. Order a Piñata – a non-alcoholic drink that is the perfect combination of coconut and strawberry blended into a smoothie. For the kids you have a choice of non-alcoholic strawberry, mango, piña colada or lime slushees. 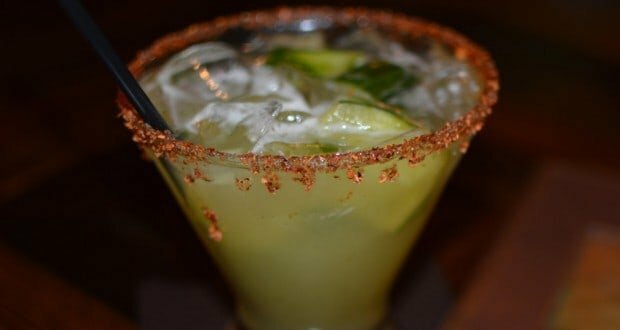 Another idea is to let the mixologists at La Cava use a variety of fresh tropical fruits, spices, and flavored salts to marry with your tequila, resulting in a spectacular margarita. The Avocado Margarita is one of my favorites. It’s a beautiful shade of creamy green, and includes ingredients such as melon and orange liquor, lime juice, agave nectar, and of course – avocado and tequila. Just in case you can’t wait to get there, now you can have a taste of La Cava at home by utilizing one of their recipes. I LOVE that they have shared these! 2. Love it for the Atmosphere! La Cava del Tequila immediately pulls you in with the comfort of rich leather seats, the worn walls and the soft glow of the lights inside. They live up to the promise of celebrating a storied past and rich heritage while still keeping a flare for the modern. If there is room for you to sit down, you are going to want to stay a while! There is just no better place to celebrate National Tequila Day on July 24th, National Margarita Day on February 22nd or Cinco de Mayo. In true Epcot fashion, you can actually be educated while you are entertained at La Cava. The cast members are knowledgeable and happy to share their culture with you. The beautiful mural on the wall takes you through the process of making tequila. From left to right you will see how it begins with growing and harvesting the blue agave plant, to extracting the juices by using a milling press, to fermenting and distilling the juices into tequila. 1. Love it for the Tequila! This of course is the no-brainer reason to love La Cave del Tequila. They have got your tequila in spades with well over 100 exquisite examples of Mexico’s national drink to choose from. Here’s a little bonus. I’m no doctor – but rumor has it that tequila will lower blood sugar, aid in weight loss, and chill you out so you can sleep. What’s not to love about that? There you have it – the top 5 reasons to love La Cava del Tequila. There are many more reasons we couldn’t cover here, so be sure to share yours in the comments!